Overall, I really like this ap. there are a lot of different and popular drink recipes, how to make them and some have pics of what they look like. Recipes are fast and easy to look up. I use this app a lot. 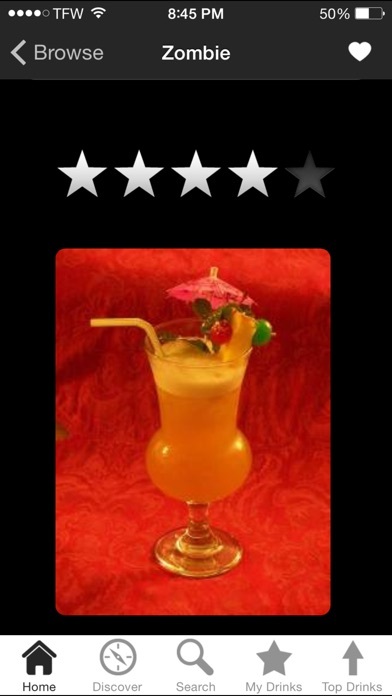 Very good app that is simple to navigate and find drink recipes in. Easily well worth it. Love this app. Easy to navigate and have found every drink needed. Good info on various drinks. My gripe is the limited search. Names have to be exact to come up in search. Adding a real search that works with partial terms or incorrect spelling would be helpful, and is expected (we've come to expect this through Google). A good list of ingredients and a great list of drinks. It even includes a method to add a drink. Missing two things: an easy way to upload a drink to be considered for the next version, and a way to add new ingredients (i.e. Honey). It is missing a lot of base alcohols. The program works good, but it won't make drinks with what I have. Stoli Blueberry, stoli salted carmel, fireball, patron citronge, absolut mandrin, X rated, chevis regal, ETC. I know you could expand the program and make it better. I like this app but my biggest problem with it is that it doesn't save custom drinks in the cloud. There is also no synchronization between devices for custom drinks. This could be easily fixed if there was an account feature. With its ability to add your own recipes, highlight favorite recipes and most of all add/manage ingredients makes this one of the best if not the best bartender apps I've ever used and I have tried so many of them. It's an excellent tool. Very convenient. It has many drinks stored already, and if you find one that's not (you made one yourself, one has a vulgar title, etc. ), you can add it. 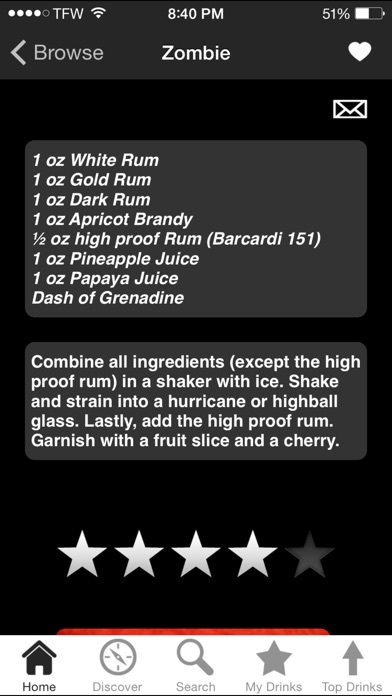 The discover feature is handy too, you just tell it what ingredients you have on hand, and it tells you the possible drink combinations. Worth the price of the app for sure. Easy to use, fairly intuitive. Just wanted some basic recipes. Hot buttered rum isn't even included. Had to Google it. Completely defeated the purpose if the app in the first place. Excellent app! The drink RX are spot on and create the perfect mix. Very useful for making drinks! This app seems to do everything! But I do wish they had a "choose random drink" function. Use it to inventory and create the drinks you like. Add ingredients and drinks not listed to customize it for yourself. This is the best app that I've found for saving your own drink recipes. My only wish, as others have stated, is the ability to sync between devices. My iPad when I'm home, and my iPhone when I'm out. Very comprehensive recipe guide. Most any drink that you can think of is there, and for the ones that aren't, they can be added. I rated this as five stars, but I can think of two things that can be improved upon. First, if you need to change one of the default recipes, you're out of luck. You have to create a duplicate. The Aviation is a fine example of this as it's missing the Creme Yvette. Second, if you are in the middle of adding a recipe but the ingredient isn't in the list, you have to exit the recipe to add the custom ingredient. Not a big deal, but it's a little aggravating at times. Other than that, this is an excellent app that I highly recommend. 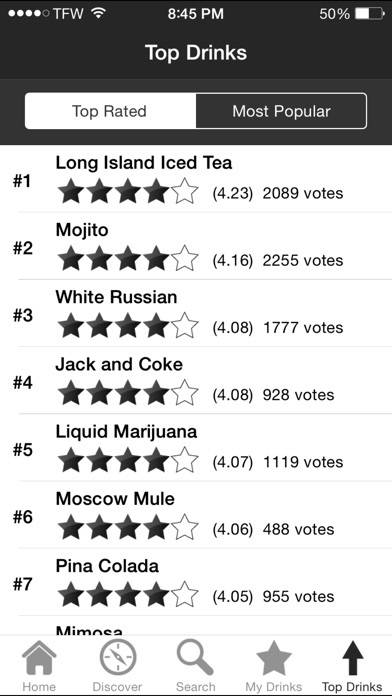 I do like the app and would have given intone more star,butI think adding your own cocktails could be made a bit user-friendly. I have some cocktail recipes I came up with and it is a task to pick and choose instead of simply typing the ingredients and amounts. Really nice app. Has a nice database of drinks, and it can grow as you add your own. Great way to find new drinks! Poor search and filter features. And doesn't even have Mezcal?! For such good ratings, was expecting more. The list of drinks is excellent, and the ability to add drinks works well. This is a really good app with great recipes built in and the ability to add your own. 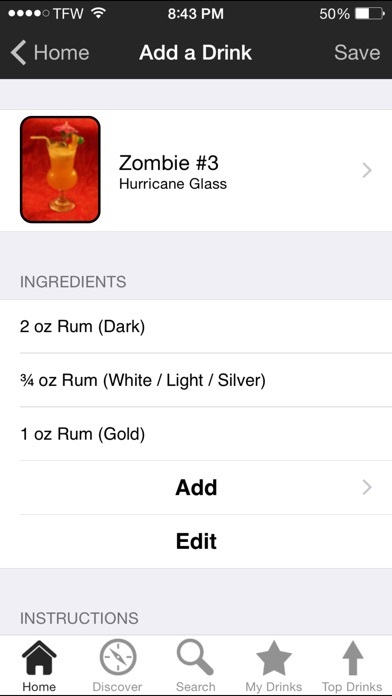 My suggestion for future updates is to allow my drinks and ingredients to be shared between devices, like iPhone to iPod. This is a great app but I would love to see the ability to create an account so that you can have a profile on multiple devices. Not at all user friendly. Can only enter your own recipes using pre-selected ingredients. For example, you cannot add creme de violette or old tom gin. To add vodka you have to scroll to the end of list or try to search. Pressing the magnifying glass brings up a blank screen without a keyboard. Great. Needs synch across devices. 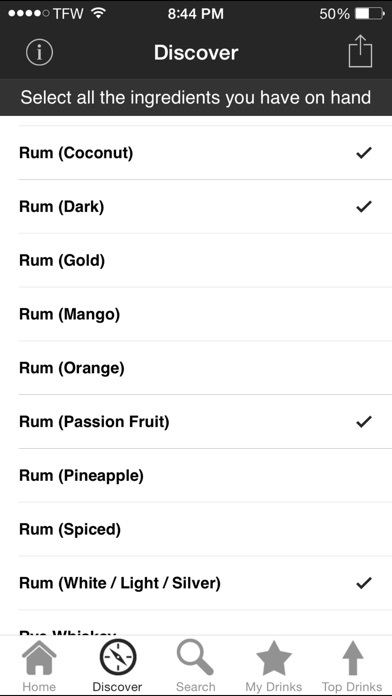 Update June 2015: I too want ability to access my custom drinks and ingredients across multiple devices. Now I have a new iPhone, and see no option but recreate from scratch all the stuff I entered into the app on my old phone. See below for additional features requested. Update Dec 2013: I use this app probably more often than I should. Frustrated that what I have entered via iPhone I have to start over on iPad. To get 5 stars, consider adding: + ability to filter drinks selection from Discover, so as to find drinks that I have on stock but that feature a certain ingredient. + links to look up a description of what a listed ingredient is and perhaps it's history. + ability to synch among devices for favorites, added ingredients, added recipes. I am a bartender and some times need an assist. This app is excellent for that! User friendly and well organized. This is a nice app. I can usually find what I'm looking for pretty quickly. Could use some of the newer drinks that get ordered at Weddings and such but those may be a regional thing too. All in all a good value. Another 99 cents down the drain. This is a terrible app. The UX is poor and it doesn't actually find any drinks when I choose ingredients. Back to a real analog book with an index for me.